OpenNebula 5.4 ‘Medusa’ is Out! The OpenNebula project is proud to announce the availability of the stable release of OpenNebula 5.4 ‘Medusa’. Medusa is the third release of the OpenNebula 5 series. A significant effort has been applied in this release to enhance features introduced in 5.2 Excession, while keeping an eye in implementing those features more demanded by the community. As usual almost every component of OpenNebula has been reviewed to target usability and functional improvements, trying to keep API changes to a minimum to avoid disrupting ecosystem components. An important focus has been on the vCenter integration, with an enhanced network and storage management. Also, new components have been added to improve the OpenNebula experience. Full storage management. Non-Persistent images are now supported as well as volatile disks. OpenNebula is now aware of all VM disks and storage quotas can be enforced. Support for linked clones and Marketplace. Full network management. It is now possible to create vCenter standard and distributed port groups and even vSwitches directly from within OpenNebula. You can assign a VLAN ID to a port group created by OpenNebula. Improved monitoring. Up to two orders of magnitude of speedup. An enhanced import process where naming limitations in imported resources has been removed and the ability to enable VNC automatically for Wild VMs. Disk resizing, VM and Templates folder selection when a VM is deployed… and many more changes! 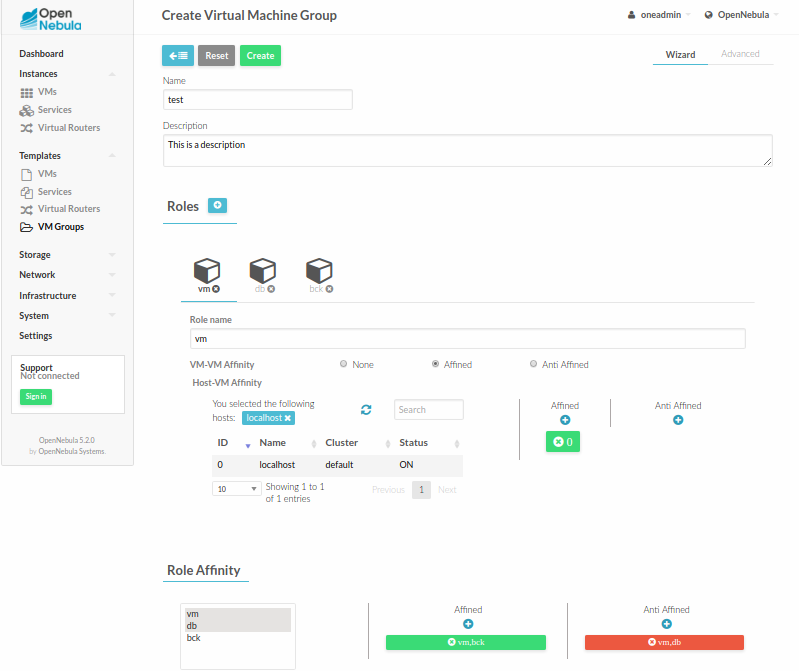 A new resource, the VM Groups, has been added to implement VM-VM and VM-Host affinity/anti-affinity rules. A VM group is a set of related virtual machines that may impose placement constraints based on affinity and anti-affinity rules. A VM group is defined as a set of Roles. A Role defines a VM type or class, and expressions to the VM Group can be added to define affinity between VM roles, or between VM and hosts. This ensures a dynamic approach to affinity/anti-affinity since new VMs can be enrolled to a particular Role at boot time, after the VM Group has been defined and other VMs added to it. To top it all, OpenNebula 5.4 brings to the table a native implementation of a consensus algorithm, which enables the High Availability deployment of the OpenNebula front-end without relying to third party components. This distributed consensus protocol provides fault-tolerance and state consistency across OpenNebula services. A consensus algorithm is built around two concepts, System State -the data stored in the database tables- and Log -a sequence of SQL statements that are consistently applied to the OpenNebula DB in all servers-. To preserve a consistent view of the system across servers, modifications to system state are performed through a special node, the leader. The servers in the OpenNebula cluster elects a single node to be the leader. The leader periodically sends heartbeats to the other servers (follower*) to keep its leadership. If a leader fails to send the heartbeat, followers promote to candidates and start a new election. This feature, with support from floating IPs and a proper Sunstone configuration, gives robustness to OpenNebula clouds. This new functionality of distributed system state is also used to implement OpenNebula federation. In both cases (Federation and HA) no support is needed from MySQL to create a clustered DB, so admins can forget about MySQL replication. There are many other improvements in 5.4, like improved VM lifecycle, flexible resource permissions, life disk resizing, improved Ceph support, enhanced disk I/O feedback, showback cost estimate in Sunstone, flexible IPv6 definition, http proxy support for marketplace, purge tools for the OpenNebula database, resource group isolation, multiple Sunstone improvements (VNC, password dialogs, confirmation dialogs, better vCenter support, persistent labels, usability enhacenents), networking improvements, user inputs in OneFlow and many many more features to enrich your cloud experience. As with previous releases, and in order to achieve a reliable cloud management platform, the team has gone great lengths to fix reported bugs and improve general usability. This OpenNebula release is named after the Medula Nebula, a large planetary nebula in the constellation of Gemini on the Canis Minor border. It also known as Abell 21 and Sharpless 2-274. It was originally discovered in 1955 by UCLA astronomer George O. Abell, who classified it as an old planetary nebula. The braided serpentine filaments of glowing gas suggests the serpent hair of Medusa found in ancient Greek mythology. OpenNebula 5.4 Medusa is considered to be a stable release and as such, and update is available in production environments. The VM Groups functionality, the configurable semantics of the VM operations permissions (ADMIN, MANAGE and USE) and the improved VM history functionality were funded by BlackBerry in the context of the Fund a Feature Program. The configurable image persistency setting and the new Non-SLAAC IPv6 Address Range were funded by University of Louvain. https://opennebula.org/wp-content/uploads/2018/11/opennebula_cloud_logo_white_bg-4.png 0 0 Tino Vazquez https://opennebula.org/wp-content/uploads/2018/11/opennebula_cloud_logo_white_bg-4.png Tino Vazquez2017-07-20 12:27:122017-07-21 17:19:36OpenNebula 5.4 ‘Medusa’ is Out!